I wanted to keep the colors and design of my baby girl's nursery simple and classy, so I decided to pick colors instead of a common theme. Essentially the colors became my theme, a pink and gold dream nursery. It took my husband and I approximately six months to complete the project. We started decorating early in my pregnancy because I wanted to make sure that I would have plenty of time to shop around for the best deals. We all know that buying all of the necessities for the nursery like bedding and other things can get really expensive quick. I initially came up with the ideas that I wanted to include in our baby girl's nursery and then shared them with my husband as things progressed as I wanted his input. My husband took care of all of the handiwork and I helped out when I could. Between the two of us we created the most perfect space for our little girl to spend her first years. I knew I wanted a feature wall in her nursery so we decided to go with metallic gold wallpaper and then chose the perfect shade of pink to build around it. If Unique Baby Gear Ideas' visitors have any questions about any of the features in our baby's room, just ask! Hi! I have been looking for this exact baby bed for my nursery and it seems as if it is now available. Would you mind sharing where you found yours? Is this the Savannah crib by Munire? 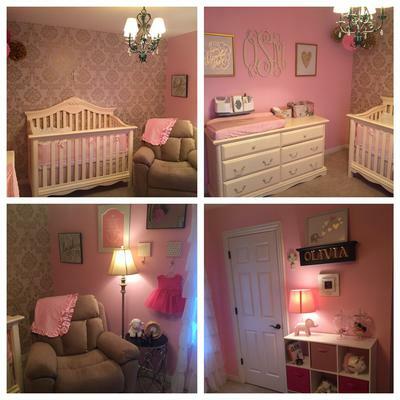 Olivia's (the sign was the tip-off to your daughter's name) nursery is gorgeous! I want to borrow some of your ideas and have some questions. First, what is the name of the wallpaper that you used, the pink paint color and could you please tell me where you found the monogram for the wall? Join in and write your own page! It's easy to do. How? Simply click here to return to PINK NURSERY PICTURES and DECORATING IDEAS.